Anyone who has spent time in a desert has probably noticed many dark streaks or patches on the rocks. I expect that most people simply look at these dark streaks and think they are simply stains like a stain on a cement driveway or that line of rust color running down a wall from a rusty nail above. No big deal right? But what if you were shown a picture of the same rock taken 50 years earlier and the stains looked identical to you? You might start to wonder just how old those stains are on those rocks. A week ago I posted pictures (NH Photography: Desert Varnish around Moab UT) of rocks with shiny black or orange varnish on them from my trip to Utah this summer. I want to explore the origins of this varnish a further today. Rock varnish is much more than just chemicals that leached out of material above and ran down than surface of a rock leaving a stain. 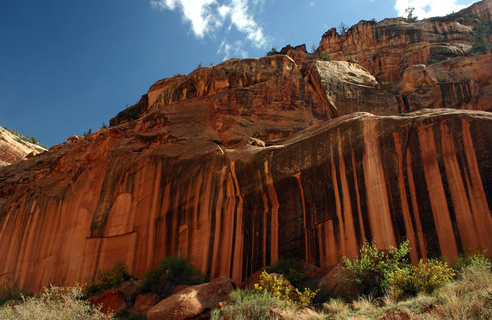 Rock varnish is a layer (sometimes hundreds of layers ) of mostly inorganic material that builds up on the surfaces of rocks that are found in environments where very little erosion occurs. One of the most common places to find rock varnish is in deserts were this varnish is called desert varnish. 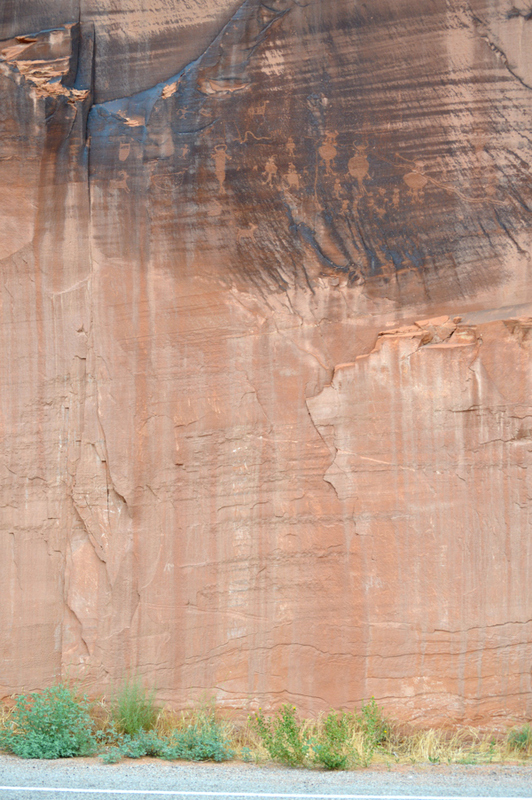 Desert varnish appears on the vertical surface of rocks but it may also appear on very stable horizontal surfaces. Rocks on the surface of the ground sometimes can form something called desert pavement and the surfaces of those rocks may also become covered with desert varnish. The origins of desert varnish have long defied full explanation. It is made up of clays and iron and manganese oxides. As such the chemical composition of the varnish is different from that of the rocks on which they form and thus the components, especially manganese, of the varnish must be derived from air-borne dust and rainwater. Rock varnish “grows” on rock surfaces rather than simply staining the rock surface. There is still much to learn about rock varnish but it is clear that rock vanish comes in many different forms differentiated usually by their chemical makeup. At least some forms of varnish appear to contain an organic component as a result of bacteria that live on or near the surface of the rock. What the exact role of the bacteria plays in the growth of rock varnish is still not clear. It may be hard to believe but bacteria are able to live on the surface or at least the upper few millimeters of the rock matrix under extreme temperatures and desiccation. Those bacteria survive by obtaining nutrients from rainwater. As they work to obtain energy from the chemical bonds in the rocks around them they end up altering the chemical makeup of their environment creating things such as manganese oxides that they give off as wastes. These become a part of the varnish over time. It could be that once some varnish is formed it then provides an environment for future bacteria to live and produce more varnish. 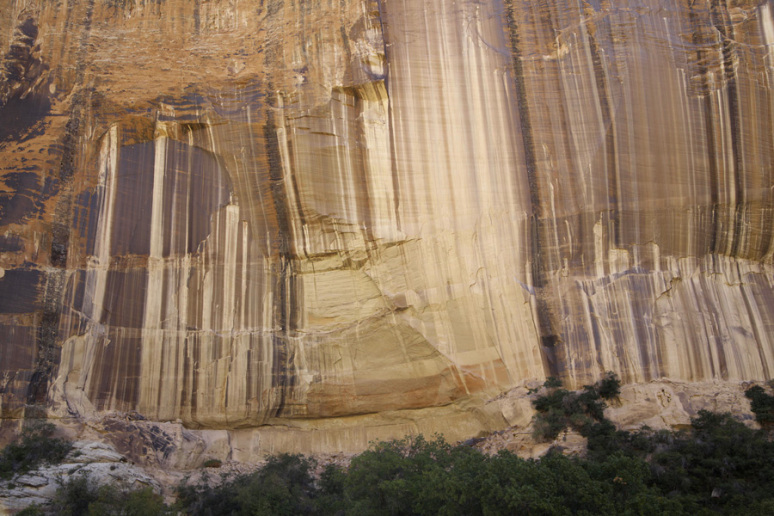 Varnish is often found as streaks down vertical cliffs. These streaks are often associated with where water runs down during storms. Bacteria can only do chemical processes when they are hydrated. For months or even years at a time they lie dormant and so the varnish does not grow at all most of the time. Some varnishes have no detectable bacteria associated with them while other do but it could be that conditions for the bacterial survival are not right in some areas and so the varnish may go years or hundreds of years without a bacterial component in them. As a result it could be that some varnish goes hundreds of years without growing in thickness at all because the bacteria necessary to generate the chemicals for its grown are not present for long periods of time. But is all varnish the result of bacterial deposition or could there be abiotic (non-living) chemical reactions that also result in desert varnish? As I said before, there is considerable debate about the role of bacteria in the creation of rock varnish. It seems likely that some forms of rock varnish can be produced abiotically though it is very likely that bacteria are important factors in the desert varnish found in the desert southwest. Can desert varnish be used to estimate the age of rock surfaces? The answer: not very precisely but it can be a useful tool when combined with other forms of dating. Rock varnish isn’t often used as a form of absolute dating because it is quite clear that the rate of varnish varies from location to location and from one year to another depending on environmental conditions. With new technology including the ability to extract and measure minute amount of material from layers of varnish has allowed some radiometric methods of dating varnish to be done. These dates have confirmed that some varnishes are tens and hundreds of thousands of years old. Through careful analysis of the chemistry of layers a form of dating has been developed called VLM dating or varnish microlamination dating (more below). This form of dating has been used to date the ages of lava flows, rock falls, alluvial fans etc. in desert regions where rock varnish is commonly found. It is easy to see that rock varnish is typically very slow-growing and thus very old. The simplest way to show this is to look at any of the hundreds of thousands of petroglyphs on rocks in the desert southwest. These artifacts are believed to range in age from a few hundred years to as much as 10,000 years old or more. Even the oldest (usually dated by association with other cultural artifacts that have been dated) petroglyphs can appear quite young because they have been preserved so well. Petroglyphs are made by scratching away the rock varnish on a rock to expose the typically much lighter sandstone beneath. The very fact that we can see these art forms today is a testimony to the exceptionally slow development of desert varnish. There is some apparent development on varnish over some of the oldest petroglyphs so we know that varnish growth still occurs today but it clearly is a slow process. In the image of petroglyphs above you can see that there is a large are of light sandstone below portion of rock with desert varnish. This rock used to be covered by a large mound of soil that had been deposited here after this portion of the canyon wall was carved. This hill leading down to the Colorado river was removed revealing the unvarnished rock. In over 50 years you can see that there is just the beginnings of some streaks on the “fresh” surface but those streaks are probably just leaching of material from the varnish above. Petroglyph carved into desert varnish found in Dinosaur National Park. What is interesting about this one is that it is o a rock covered with rock varnish but the rock next to it has no varnish. This is a very old cliff face that once was completely covered with varnish but pieces of the wall have fallen away leaving only this oldest part left. These petroglyphs were probably not even drawn until after the other portions of the wall were broken off leaving only this place for the artist to work. These petroglyphs attest to the fact that the rock formations that we observe in the desert southwest have looked about the same as they do today since the first people laid eyes on them. 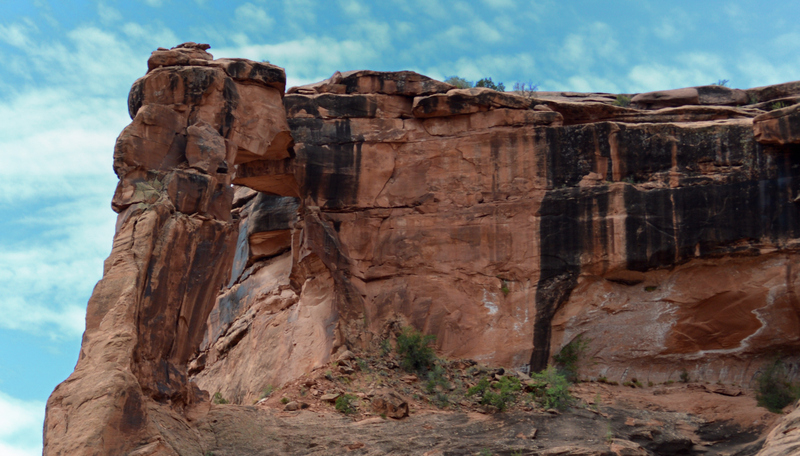 How old are the arches in Arches National Park? They are typically thought to be at least hundreds of thousands of years old. The rock varnish on them tells us that they have looked nearly the same as they do today for thousands of years and the varnish that we see on some surfaces have been present there for at least 10 thousand years and likely much much longer. Remember where ever you see rock varnish you know that surface has essentially experienced no erosion at all since the rock varnish began to form. These surfaces are nearly frozen in time. 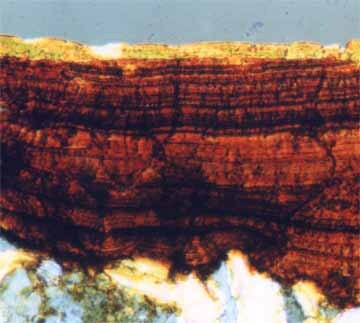 Rock varnish is less than a millimeter thick but when cross-sectioned and examined under a microscope the varnish is found to be made of many very thin layers. Those layers represent growth of vanish under different environmental conditions. I’m not talking about summer and winter conditions but rather periods of hundreds or thousands of years which experienced temperatures and moisture differences leading to conditions that produced a unique chemical signature during that time frame. 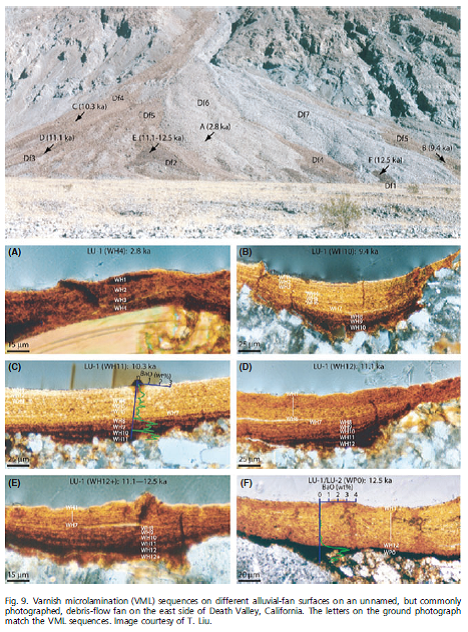 In the image to the right you can see cross sections of rocks found on the surface of a death valley alluvial fan. This erosional feature is thought to be quite old and the fact that the upper surfaces of rocks on this fan have built up large accumulations of desert varnish is evidence that this is the case. Dr. Tanzhuo Liu has spent 20 years studying desert varnish his chemical studies of the microscopic sections of this varnish have allowed him to correlate the chemical signatures in layers with various ice age periods. The varnish on these rocks on this alluvial fan are estimated to have formed over a period of 25,000 years. That these rocks have laid in this position that long tells us that this alluvial fan looked almost exactly the same as it does today that long ago. Liu can use his varnish chronometer to determine when different portions of fans like this were deposited. A recent (Spilde et al. 2013) article suggests that some rock varnish may grow at a faster rate than previously suspected allowing for some varnish to have grown to their present thickness in just a few thousand years. 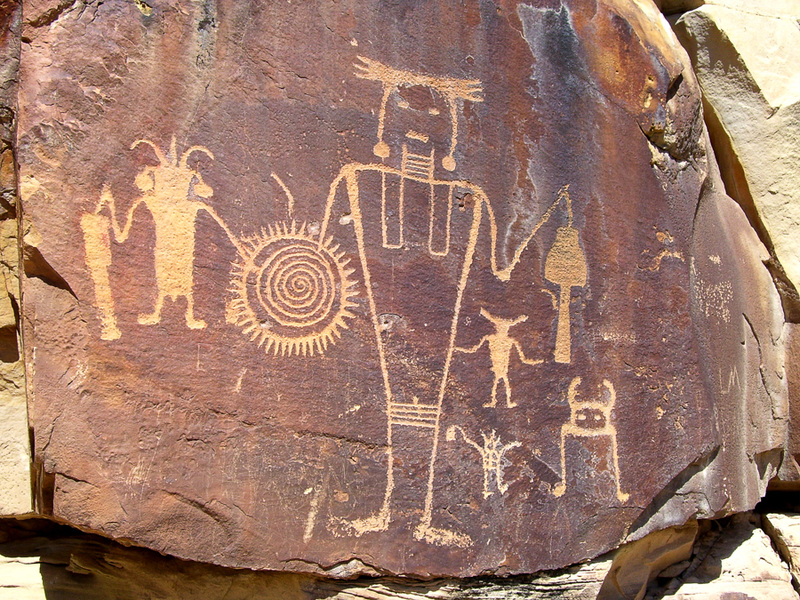 Just from looking at petroglyphs we know that not all varnish can be produced in just thousands of years. If shown to be accurate research it may well be there are special circumstances that allow some forms of varnish to grow more quickly than others. There are many different forms of rock varnish each of which probably depends on a variety of conditions to grow so it is difficult to make statements about rates of growth that apply to all forms of varnish. Clearly rock varnish is not something that usually happens overnight. While we might not know exactly how old much of the varnish is we can see that it was not all formed at one time and that the process continues even today. Rock varnish tells us that the geology of the desert southwest has been very stable for a long period of time. Change occurs very slowly here and the rock varnish allows us a way to determine what the oldest surfaces are and what surfaces have undergone relatively recent changes. It seems apparent that the first people to lay eyes on these part of the world saw a world that looked incredibly similar to what we see today including the varnish on the rocks. 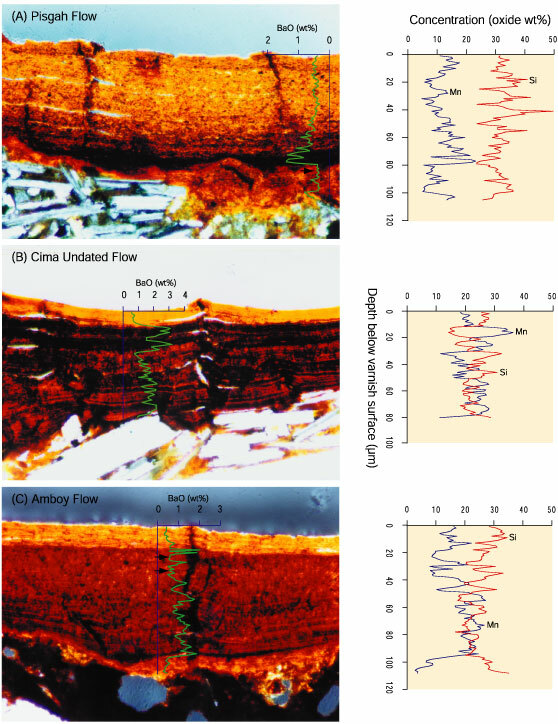 Spilde, Melim, Northup and Boston, “Anthropogenic lead as a tracer of rock varnish growth: Implications for rates of formation,” Geology, published online January 4, 2013, doi: 10.1130/G33514.1 v. 41 no. 2 p. 263–266. Thank you for posting this. I’ve always wondered about the varnish and how it is formed.